An optional design feature allows each pontoon to retract or extend outward hydraulically. 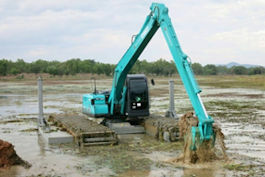 A fully retracted pontoons with reduced footprint provides the added advantage and convenience of transporting the machine on trailer without dismantling into modules. A tremendous saving on logistical cost over time. Fully extended pontoons provide the extra stability when situation call for. The hydraulic control is totally independent (non shared) from the existing hydraulic circuit. We have an upgrade kit where an auxiliary hydraulic function can be added with full control from the operator cabin. Supplementary pontoons can be easily attached onto the outer side of the primary pontoons to enhance stability. The hydraulic-mechanical spuds system which is control from the operator cabin is a superb solutions to overcome buoyancy in deep water, providing additional stability and enhanced operability on water up to 4 meters deep. Users can chose to add the supplementary pontoons and spuds system at the later stage when need arises. Auxiliary hydraulic lines are preinstalled on all primary pontoons whereby the user can simply installed without tedious modification. A truly pulg-and-play system and future proof in design. The track shoes/cleats are steel fabricated and are robotically welded to utmost precision. Steel is favoured over aluminium alloy because of its malleable property. Customer may opt for the polymer track shoes instead. 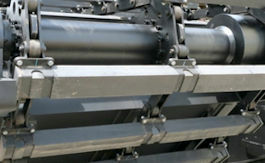 The grade of polymer we have selected is extremely tough and yet appropriately flexible for its application. It can better retain its shape and is less susceptible to deformation than ferrous based or aluminum alloy. EIK Engineering has designed a unique clamping system which is far more reliable than the direct bolt-secure system. Their engineering team has conducted extensive exercise and clocked enormous of hours on field testing, experimenting with various clamping system. And they finally have a superior solution that will stand the test of time. The polymer track shoe is fully backward compatible, customers who have invested in our pontoon undercarriage can be easily upgraded.